It's all in the game!! 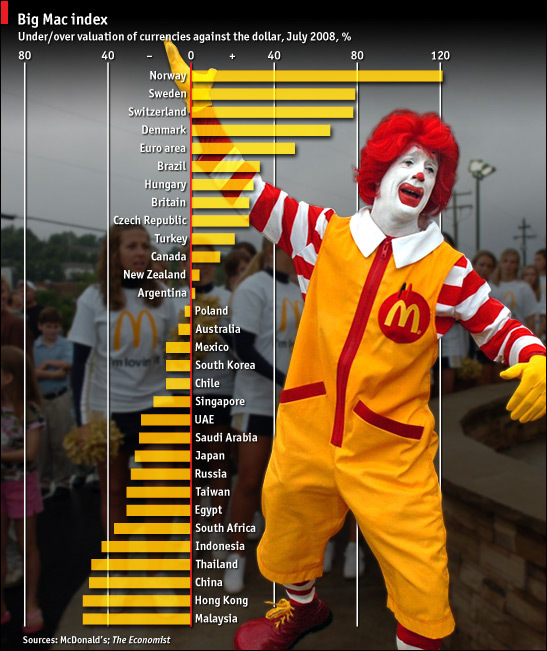 : The BIG MAC Index! 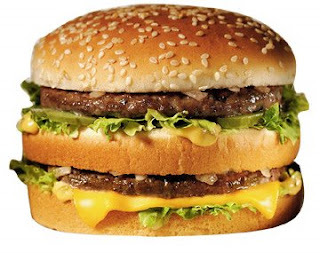 The Big Mac (from Mc Donalds) is the hamburger. consisting of two 1.6 oz (45.4 g) beef patties, special "Mac" sauce, Iceberg lettuce, American Cheese, Pickles, and Onions, all served on a three part Sesame seed bun. It is one of the company's signature products. The Big Mac Index was introduced in The Economist in September 1986 by Pam Woodall as a semi-humorous illustration and has been published by that paper annually since then.  The index also gave rise to the word burgernomics.  Burgernomics is based on the theory of purchasing-power parity, the notion that a dollar should buy the same amount in all countries. Thus in the long run, the exchange rate between two countries should move towards the rate that equalises the prices of an identical basket of goods and services in each country.  Our "basket" is a McDonald's Big Mac, which is produced in about 120 countries. The Big Mac PPP is the exchange rate that would mean hamburgers cost the same in America as abroad.  Comparing actual exchange rates with PPPs indicates whether a currency is under- or overvalued. more on the Big Mac Index... pls visit following link. it make us wonder, why India is not on this list. Sarabjeet Maam unoda aarvatha parthu adipoiruvvanga! the big mac and big mac index really impressed me da!